Citation: C N Trueman "Henry VIII and Ireland"
Ireland played a minor part in the reign of Henry VIII. Royal concern in Ireland extended as far as the Pale – four small counties around Dublin. The Irish nobility ruled the area around the Pale – known as the Colony. Royal decrees had given them the right to do this. The most powerful family was the Fitzgerald’s, the Earls of Kildare. The rest of Ireland was known as the Lordship. The families who ruled this area had no binding loyalty to the monarch nor were they under royal law. However, this land offered little to the Crown, as it was so barren. Therefore, they had little interest in it. Ireland had a strong religious affiliation to Rome. However, there is little evidence that countries such as Spain saw Ireland as a place to start an invasion of England. The senior noble families had nothing to gain from Spain using Ireland as a launch pad for an attack on England. However, they had much to lose. While they maintained law and order in the Colony and paid their feudal dues, London paid little interest in them. Therefore within the Colony the Fitzgerald’s wielded great power and authority. There was no reason to think that they would have jeopardised this position to help the Spanish even if both were Catholic. However, the Spanish did use any trouble in Ireland to stir up trouble and resentment against English rule. Not only did this have the potential to be a useful lever against the English, it was also cheaper than a full-scale military attack, the success of which could not be guaranteed. One such rebellion was in 1534 and was led by Thomas, the son of the 9th Earl of Kildare. His father had been ordered to London to answer various charges. However, his death in the Tower of London caused Thomas to renounce any allegiance he had to the Crown. He gathered a force around him and marched on Dublin. The city held out despite being besieged. In October 1534, Sir William Skeffington landed with a force and quickly subdued Thomas. In early 1535, Thomas surrendered after Maynooth Castle was successfully besieged. He and his five uncles were arrested and sent to London. All were attainted and executed in 1537. Thomas Cromwell wanted to bring the Pale under greater control from London. To this end he sent 340 troops to be permanently stationed in the Pale. He had 42 statutes he wanted introduced into Ireland and he needed a compliant Pale to do this. The purpose of these 42 statutes was simple – to extend still further royal power within Ireland. The most important of these statutes was to be Henry’s supremacy over the Irish Church. Between 1536 and 1537, a subservient Irish Parliament passed into law statutes referring to the Reformation that had already impacted England and Wales. 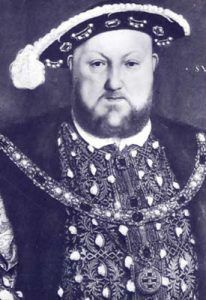 By 1547 nearly all the major figures in Ireland had accepted Henry’s supremacy. Monasteries were dissolved but it was a slow process outside of the Pale and Colony. Many simply saw no need for change. For the Irish, the whole Reformation issue was a sign of English supremacy over them – hence the lack of any great desire to push it through with any great speed. In 1541, the Irish Parliament bestowed on Henry the title ‘King of Ireland’. The Irish nobility accepted this as it placed Ireland separately from England and Wales and gave Ireland its own sense of unity. Until Henry’s death in 1547, Leger continued with his policy of conciliation and building relationships with the Irish nobility.